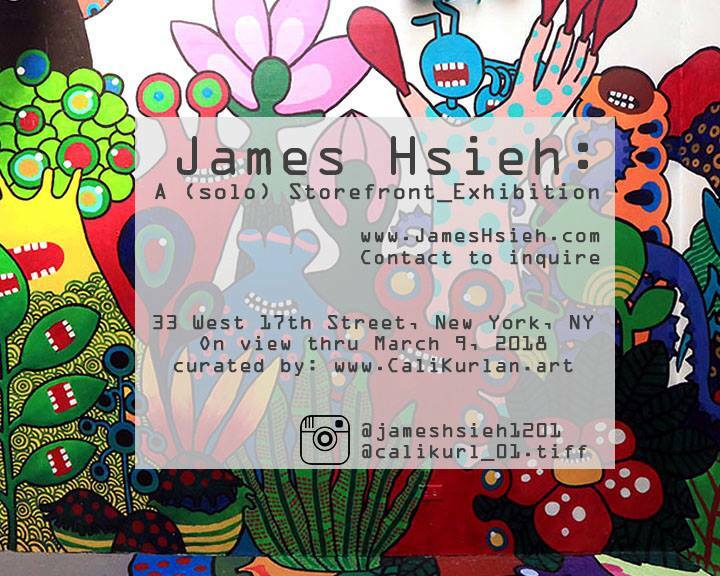 Cali D. Kurlan: I am pleased to announce a recent show I curated in New York City. James Hsieh: a (solo) Storefront_Exhibition is now open for viewing at the un-enterable storefront: 33 West 17th Street, New York, NY. This is one of a select few exhibitions I have curated and when the opportunity became available I was excited to work with James Hsieh for the first time. After we graduated together from Parsons MFA Fine Arts program, we attended each others openings and events in NYC, always discussing along with other colleagues the sacrifice and vulnerabilities of placing your artwork out into a world being the public, a beautifully uncontrolled realm, as well as the art world- where artworks get placed within group exhibitions either abstractly or even scarcely related to the depths of the artists inspiration. Watching this body of work grow, projecting my similar observations- this exhibition came together as a marking of these collaborative realizations. In the same space of the ongoing public display, there will be an evening event*** organized by Kurlan- of like-minded and aware individuals within the art and music world and industries’ future, such is the band Late Night Episode. A performance will commence a week after James Hsieh: a (solo) Storefront Exhibition is on public display. This is a private event and however it seizes to allow for opportunities for the sculptures and installation to be shared, they acknowledge the differently contained public, human reaction as it will live behind the Glass Fence (www.calikurlan.art/glassfence : a previous exhibition by the title at 33 W 17). As James Hsieh has commented, “my works are inspired by my bizarre dreams, full of alien creatures and inexplicable wonders”. For as dreams are a place, rather a wonder-scape that breed his artworks, the happening accentuates the public content from once decontextualized to a re-contextualization: a new space for exhibition and interaction. This event will take place Tuesday, March 6, from 6—9 PM and is invitation only. Read more about James Hsieh and Cali D. Kurlan. Find the Facebook event for this show with more details here.